KIEV, Ukraine -- Russia is letting separatist rebels use its territory to attack Ukrainian border posts, a top security official charged Friday as clashes in southeastern Ukraine killed nine more government troops. Ukrainian troops stand at a checkpoint near Slavyansk, eastern Ukraine, Saturday, July 5, 2014. National Security Council Secretary Andriy Parubiy also said Russia was massing troops near the Ukrainian border — a statement that could not immediately be verified. The two neighbors, who share a 2,000-kilometer (1,250-mile) border that is unmarked and unguarded outside of a few checkpoints, have been trading claims and counterclaims ever since Ukraine began fighting pro-Russia separatists in April. The government said nine troops were killed and 13 others wounded in Friday's fighting in the east, according to the Interfax news agency. It did not elaborate on where or how the deaths occurred. Ukraine says Russia is arming and supporting the separatists, a charge that Russia denies. Ukraine is also wary about Russia grabbing more territory after Russian President Vladimir Putin annexed Crimea in March. Putin, however, has ignored rebel requests to join Russia and calls by Russian nationalists to send troops into Ukraine for fear of more Western sanctions. Ukrainian President Petro Poroshenko said Friday that Ukraine had proposed a place and a time for peace talks but had not heard back from the other parties. Representatives from Ukraine, Russia and the rebels took part in earlier talks along with representatives of the Organization for Security and Cooperation in Europe. 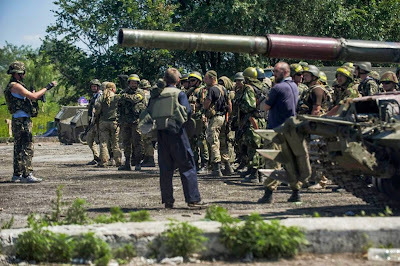 Parubiy said government forces were attacking rebel positions in eastern Ukraine with artillery and planes and that 17 villages had been recaptured since a unilateral cease-fire expired Monday. He said Ukrainian forces now controlled 23 of the 36 local regions within the Donetsk and Luhansk provinces that that have declared independence. It is nearly impossible to prove or disprove the claims from opposing sides, since the fighting consists of intermittent clashes with no fixed front line and it is dangerous for journalists and other observers to travel around. Five journalists have been killed covering the conflict and teams of OSCE observers have been kidnapped by rebels. Insurgents in Luhansk said Friday they have killed 125 Ukrainian troops, destroyed nine armored vehicles and downed three combat aircraft since Wednesday. Rebel claims of government troop deaths have been exaggerated in the past, however. The city of Slavyansk in the Donetsk region has been a key flashpoint in the fighting. 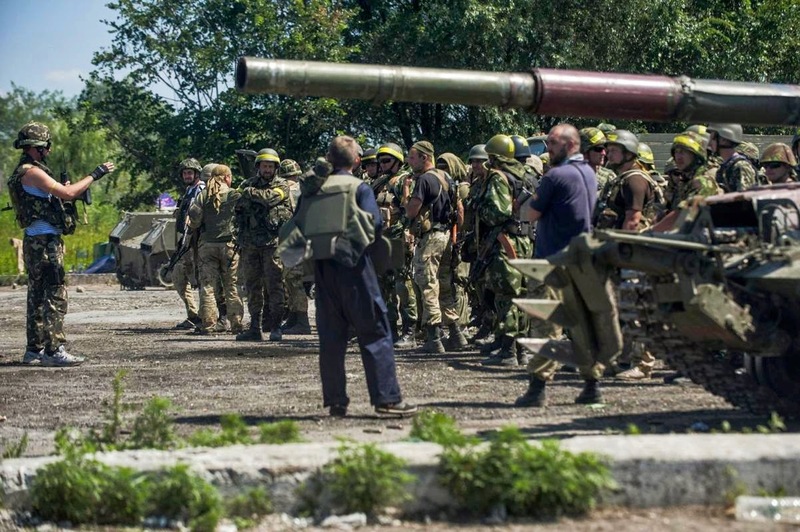 While Parubiy claimed that the government troops had flushed the rebels from Mykolaivka on the outskirts of Slavyansk, rebels there said Friday they have retained control of it. Rebels shelled the Donetsk airport overnight. An AP reporter at the site said a radar or communications tower there was still burning Friday. NATO's drills in the western part of the Black Sea just a few hundred miles from Ukraine's coast involve ships from the U.S., Bulgaria, Greece, Romania and Turkey. They were to continue until July 13.